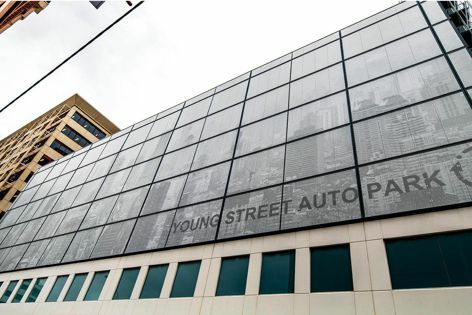 Young Street Carpark by Cheesman Architects features 525 Pic-Perf panels depicting the Shanghai skyline. Situated in the heart of Adelaide’s CBD, the Auto Park carpark on Young Street is a handy drop-off point for much of the inner city, particularly the Gouger Street and Chinatown areas. Rather than producing just another central Adelaide carpark, Cheesman Architects opted to take advantage of Locker’s Pic-Perf technology to produce something more interesting. The facade features a beautiful image of the Shanghai skyline punched into the 525 panels used for the design.